I visited Tuckahoe Plantation recently. I wanted to see more brick work, after studying the walls of Gunston Hall. The Tuckahoe Plantation Main House has brick end walls on the south wing, c.1733. HABS has drawings that I could use, even though they are very small: 1/8"= 1'-0"
The Plantation is on a bluff above the James River.Originally visitors came by boat. I came by car, turning off a narrow road onto a dirt lane lined with trees and pastures for horses and cows. Finally the buildings appeared, and parking for my car. I liked entering on foot at a slow pace. There are few signs, and no visitors center. I was almost the only person on the grounds and enjoyed it all, even as I was studying the buildings, thinking about them carefully I hope to go again for a thorough tour of the house (open only by appointment). The upper photograph is of the south wing facing the James River. The second is the west wall of the south wing. 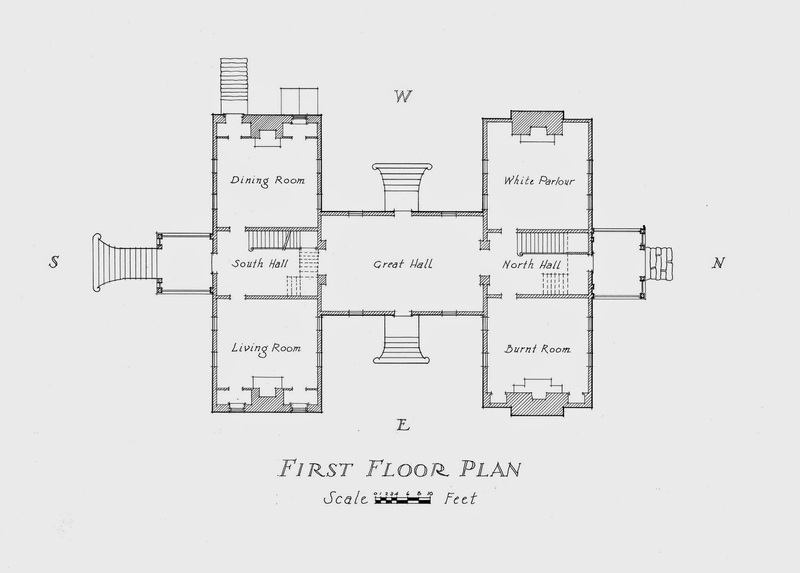 As the floor plan shows the House has two wings joined by a Great Hall. It is also surrounded by stately trees and shrubbery, therefore hard to photograph as a whole. The end walls of the south wing feel much more hand wrought than do the walls of Gunston Hall. There is also a subtle brick pattern, dark and light. The North Wing end walls are not brick. 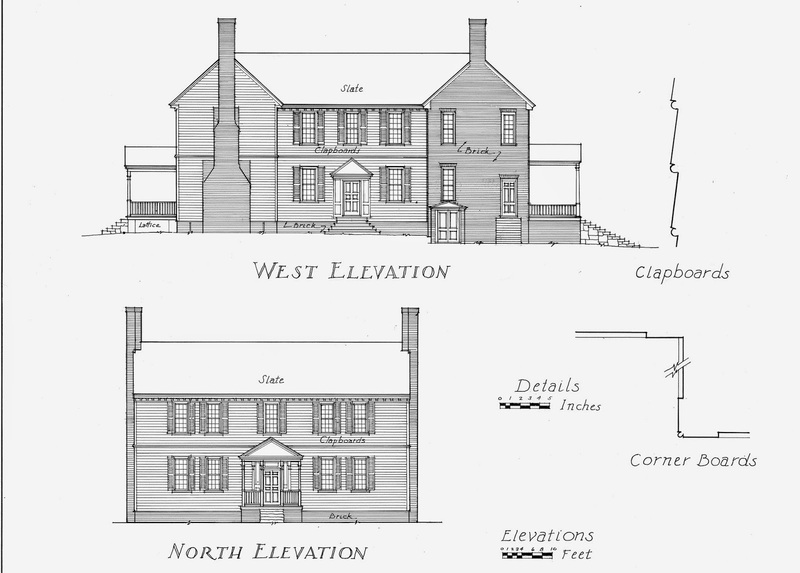 The foundation (above grade) for the house is brick, but the north wing, added in 1750's does not seem to have a basement - no windows or doors, only vertical slits in the walls. I wondered if this difference, as well as the change in chimney construction, would also be visible in the geometry, whether it represented a change in how the north wing and possibly the Great Hall were considered, laid out, and built. Here are the diagrams. The geometry does change. I have drawn 3 green diamonds on the South Wing (They could be 3 squares, same proportions.) To the center one I have overlaid the red square and added the diagonals of the half squares which cross at the walls of the South Hall. The points of the diagonals also determine the window openings. The rooms are not quite square. Both of the North Wing rooms are square - noted by green squares with their diagonals. The squares divide in thirds - red lines in upper square. Then a new square - drawn in red - is extended to determine the width of the North Hall. The Great Hall is 2 squares crossed. I've drawn one in green, the other in red. The space where they cross is the entry, the crossing determined by the squares divided into thirds. I wondered if the brick end walls would be 3-4-5 triangles, which would be structurally sound. They appear to be - see the green diagonal on the south end wall. The window and door sizes and placements do not neatly fit the pattern. 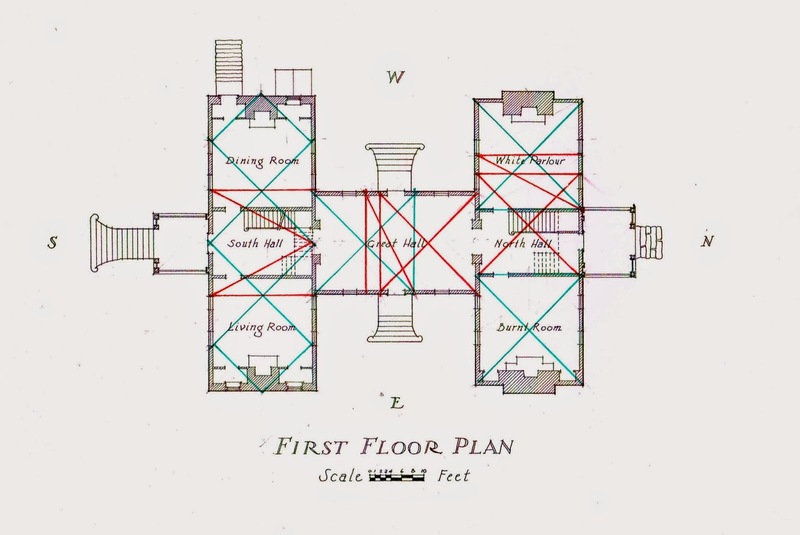 The Great Hall elevation is crossed squares - in green, just as its plan is. The edges of the squares mark the edges of the windows. The diagonals' crossings mark the height of the door, the centers of the door panels. The North Wing end wall is 2 squares - in green, divided in halves and thirds - in red. This also continues the floor plan geometry. The roof pitch comes from the frame - not quite a 12/12, determined by the geometry, not by numbers. The North Elevation can be looked at two ways. On the right I have drawn the square (the diamond which marks the centers of the square's sides) beginning at grade, including the foundation. The left edge is at the door frame. On the left side I have drawn a square with its diagonals. The length of the square is the height of the wood frame of the wall of the wing; it does not include the foundation. That square ends at the edge of the paneling for the entrance, which are noted on the floor plan. I do not know enough about the framing for this house. In the Northeast I have seen and worked on many buildings from this period and have knowledge of standard framing and regional variations. I can show how the geometry determined the framing and therefore the design. I wonder if Tuckahoe's framing changed between 1733 and 1750. 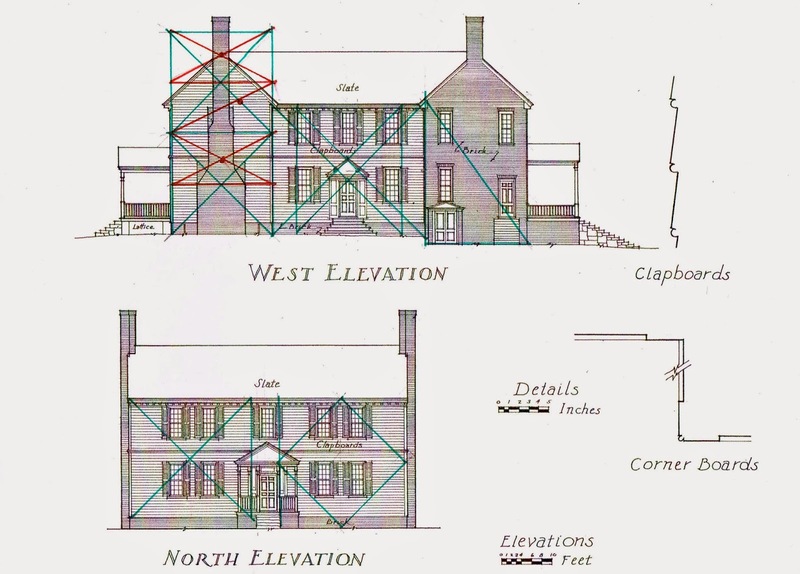 Part of my reason to visit to Tuckahoe was to see its intact measured one and two room houses that looked in the HABS drawings very much like the houses Henry Glassie wrote about. I will write about that next.